You've probably heard the term "antibiotic apocalypse"—seen it in the headlines, heard it spoken about in grave tones on the news but what, exactly, is it? Are we all going to die? Will it be a nasty end? We need to know. Well, YouTube channel Kurzgesagt – In a Nutshell is here to help explain things in handy video format. The concept comes from the fact that we are overusing and overprescribing antibiotic medicines, ingesting them for symptoms like the common cold when they should be used as a last resort. We're also using them in meat production too to kill bacteria to stop animals getting sick and to keep food production costs down. The result is that each time we use them some strains of bacteria evolve and develop a resistance to these antibiotics—all known antibiotics anyway. The concern is that these immune bacteria will spread it to other bacteria and create superbugs. 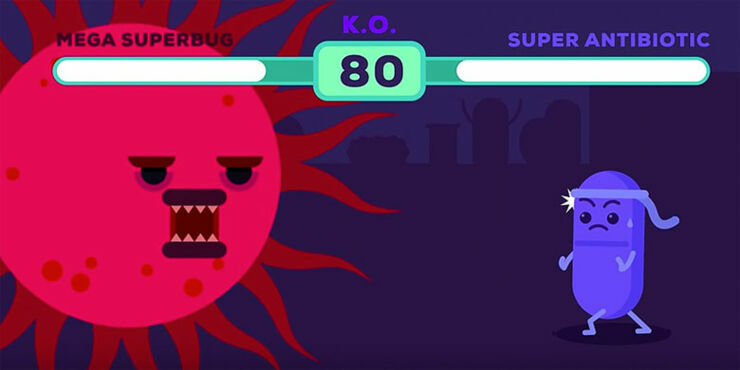 Now, there are antibiotics to use against bacteria that have developed resistance, but these have to be used sparingly otherwise it could lead to the creation of a super bacterium. And that's not good news. However, then came the discovery in 2015 in China that some bacteria had already built up a resistance to one of these last-ditch antibiotics, one called Colistin. This could cause huge problems if it gets out of hand, especially as our globalised world is the perfect environment for fostering a pandemic. But there is good news, the bacteria may be evolving but research is constantly being done to combat them and develop new antibiotics. As long as that happens and we stay one step ahead, the antibiotic apocalypse won't be happening just yet.